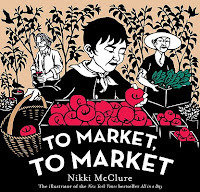 To Market, To Market by Nikki McClure. Grades 1-5. Abrams Books for Young Readers, 2011. Unpaged. Review copy provided by my local library. It's getting to be that time again - Farmer's Market season! This summer, as you visit the farmer's market (or the grocery store) with your kids, be sure to share To Market, To Market with them for the stories behind the foods you're buying. 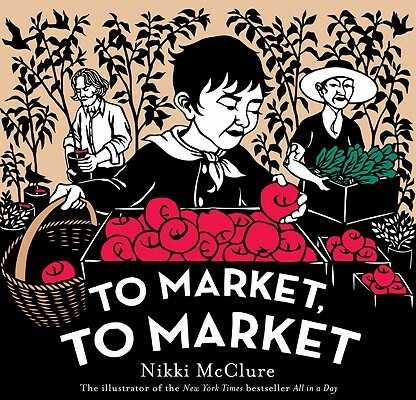 In this book, a family takes a trip to the Market. As they stop by each booth to get the items on their list, they learn where that item came from. The first item on their list is apples and there's a spread showing the little boy picking out apples from a farmer's booth. On the next spread, there's a page of information about the apple farm and how the apples grow and the farmer picks them to take to the market. This pattern continues with the other items the family buys - kale, smoked salmon, honey, blueberry turnovers, cloth napkins, and cheese. This book would be great for a unit on food, healthy eating, communities, or farms and is perfect for sharing before a trip to the farmer's market or grocery store. It will inspire kids and families to ask about where their food comes from and how it got to their table. It's Nonfiction Monday! Head on over to Great Kid Books for this week's roundup!